Turtledove, Harry, and Martin H. Greenberg (eds.). 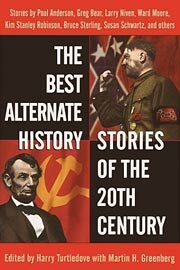 The Best Alternate History Stories of the 20th Century . Ballantine/Del Rey 2001. Summary: Anthology of reprints, including Poul Anderson's w88 android, Greg Bear's "Through Road No Whither", Gregory Benford's "Manassas, Again", Jack L. Chalker's "Dance Band on the Titanic", Brad Linaweaver's "Moon of Ice", Ward Moore's "Bring the Jubilee", Larry Niven's "All the Myriad Ways", Kim Stanley Robinson's "The Lucky Strike", William Sanders's "The Undiscovered", Susan Shwartz's "Suppose They Gave a Peace", Bruce Sterling and Lewis Shiner's "Mozart in Mirrorshades", and Harry Turtledove's "Islands in the Sea" along with two other non-allohistorical stories. Published: Ballantine/Del Rey 2001 (0345439902BUY).